Shocks active vibration control reduces vibration. BREAKING UP SMALL AREAS OF CONCRETE OR ASPHALT. MAXIMUM CONCRETE THICKNESS - 5". 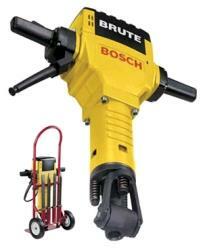 * Please call us with any questions you may hav about our breaker hammer elec. 60 lb rentals in Wayzata MN and the Western suburbs of Minneapolis.